From the panel, you can change an appointment's status without having to open the appointment. You can view appointment and patient information right on the panel instead of having to navigate to different areas of a patient's record. If you click (or tap) the name of a patient on the panel while you are in the clinical chart, that patient's record is selected. So, you don't have to select a patient, which takes you to his or her overview page, and then navigate back to the clinical chart. The same is true if you are viewing the ledger, patient information, treatment planner, or another page of a patient's record when you click a patient's name on the panel. 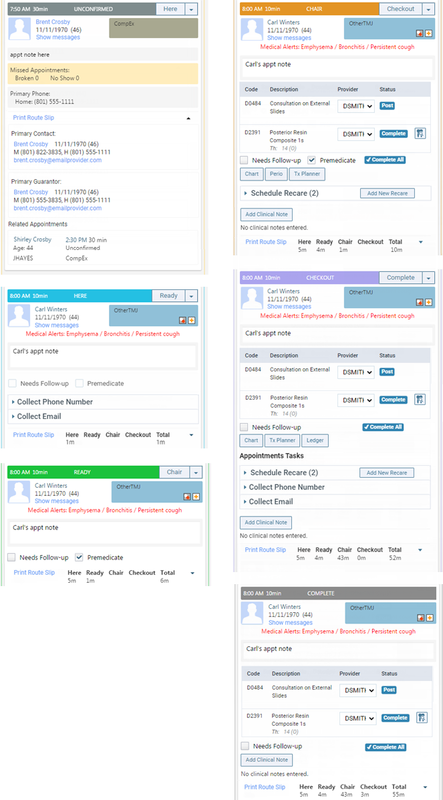 Patients are grouped by status, and only the patients' appointments with statuses that you are subscribed to appear. 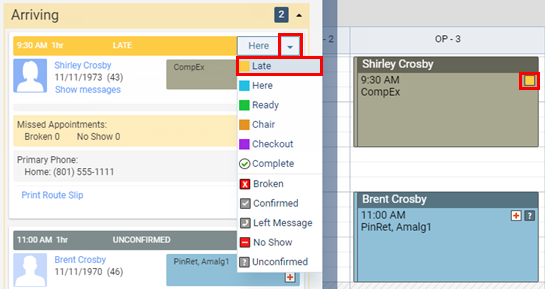 As appointment statuses change, the panel is updated automatically, and you receive pop-up notifications whether or not the panel is open. 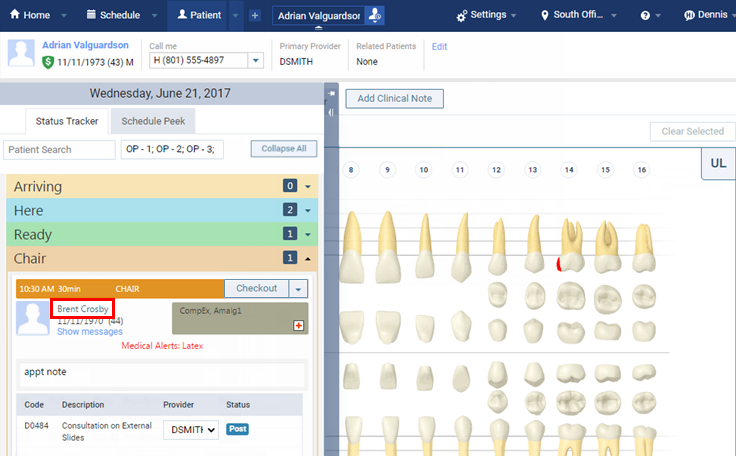 The Patient Routing panel is available at all times while you are logged in to Dentrix Ascend. To open or close the panel, click (or tap) anywhere on the thin, vertical bar on the left side of your browser window. While the panel is open and unpinned (opens over any content on the page), to pin the panel so that it opens next to any content on the page, click (or tap) the left-pointing pin icon . While the panel is open and pinned (opens next to any content on the page), to unpin the panel so that it opens over any content on the page, click (or tap) the down-pointing pin icon . 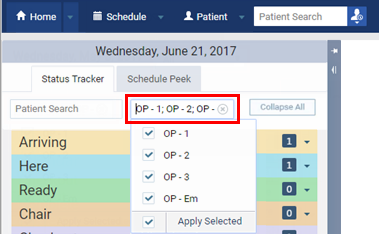 When you initially open the Patient Routing panel, the Status Tracker tab is selected, and each status section is collapsed. The number of patients within a given status appears on the section header. Click (or tap) a section header to expand that section and view the corresponding patients. 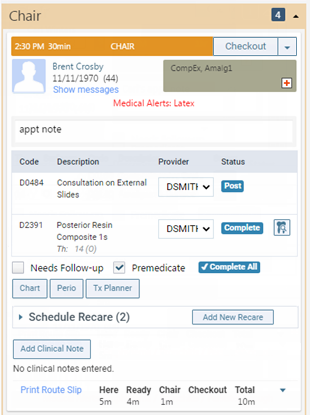 Patient information - The patient's photo, name, birth date, age, and medical alerts appear. Contact information - The patient's Primary Phone number (Arriving and Here statuses only), Address (Here status only), and Email address (Here status only) appear. If an item of information has a link, you can click (or tap) that link to add or edit the corresponding information in the patient's record. Missed appointments - The number of Broken and No Show appointments for the patient appear under Missed Appointments (Arriving status only). Appointment information - The appointment's start time, duration, status, and procedures appear. To view all the details of the appointment, click (or tap) the appointment card on the panel; the Calendar page opens (if not already open) with that appointment selected, and the Appointment Information panel for that appointment opens. Appointment note - Any notes that were entered for the appointment appear. 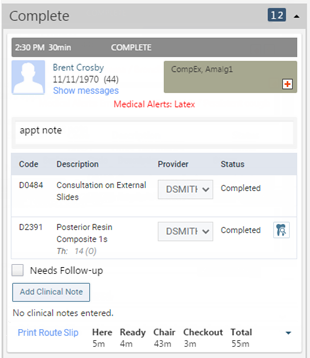 You can edit the appointment notes as needed (Here, Ready, Chair, Checkout, and Complete statuses only). Follow-up - Select or clear the Needs Follow-up check box to specify whether the patient needs to be followed up with after treatment or no follow-up is needed with the patient (Here, Ready, Chair, Checkout, and Complete statuses only). Premedicate - Select or clear the Premedicate check box to specify whether the patient needs to be medicated before treatment or no premedication is needed for the patient (Here, Ready, and Chair statuses only). Other patient and appointment information - To view the patient's primary contact information, guarantor information, and appointment details of others who are related to the patient, click (or tap) the down arrow. To hide the information, click (or tap) the up arrow. Procedures - To post a procedure that is attached to the appointment, click (or tap) Post. To complete and post a treatment-planned procedure that is attached to the appointment, click (or tap) Complete. (Chair, Checkout, and Complete statuses only.) To view the patient's Ledger, click (or tap) the Ledger button (Checkout status only). 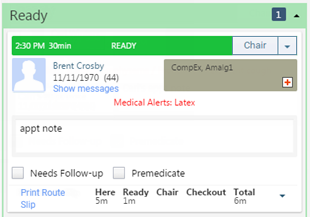 Clinical and recare buttons - To view the Chart (Chair and Checkout statuses only), Perio (Chair status only), or Tx Planner (Chair and Checkout statuses only) in the patient's record, click (or tap) the corresponding button. To schedule a recare appointment for the patient, click (or tap) the Schedule Recare button (Chair status only). Print Route Slip link - To print a route slip for the patient, click (or tap) the Print Route Slip link. 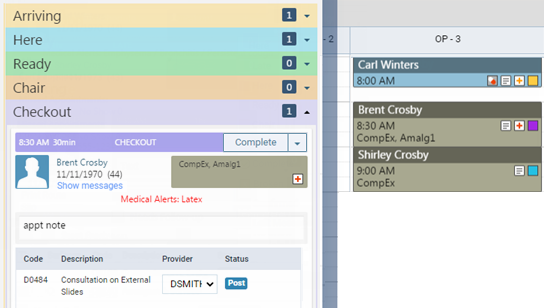 The Patient Routing panel shows patients with appointments in all operatories by default. To view patients' appointments in a specific operatory, select that operatory from the list at the top of the panel. 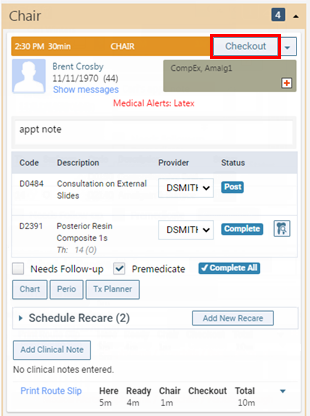 The label of the status button (under the patient's birth date) on the Patient Routing panel reflects the next status that will be assigned to the appointment if you click (or tap) the button, it does not reflect the current status of the appointment. To change the status of an appointment to the status indicated by the status button's label, click (or tap) the status button. To change the status of an appointment to a status other than the one indicated by the status button's label, click (or tap) the down arrow of the status button to open a menu, and then click (or tap) a status. 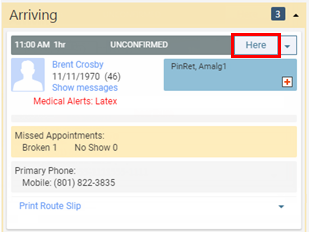 If a patient is late for his or her scheduled appointment, from the Here status button menu, click (or tap) Late. The appointment's status changes to Late, but the patient remains under Arriving. The receptionist at the front desk has the Calendar page open because he or she just finished scheduling an appointment for a patient who called in. The Patient Routing panel is also open. 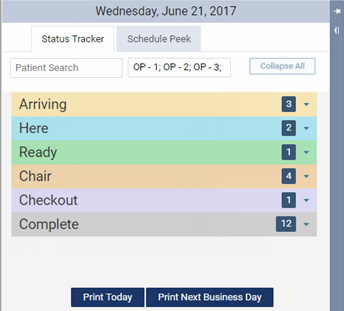 When a patient arrives at the office, the receptionist clicks (or taps) the Here status button for that patient on the Patient Routing panel. Note: The Here status button is not available if the patient is a new patient who booked the appointment online and if you have not assigned or created a patient record for the patient. The appointment's status changes to Here, and the patient now appears on the Patient Routing panel under Here. When the patient is all checked in, the receptionist clicks (or taps) the Ready status button. The appointment's status changes to Ready. 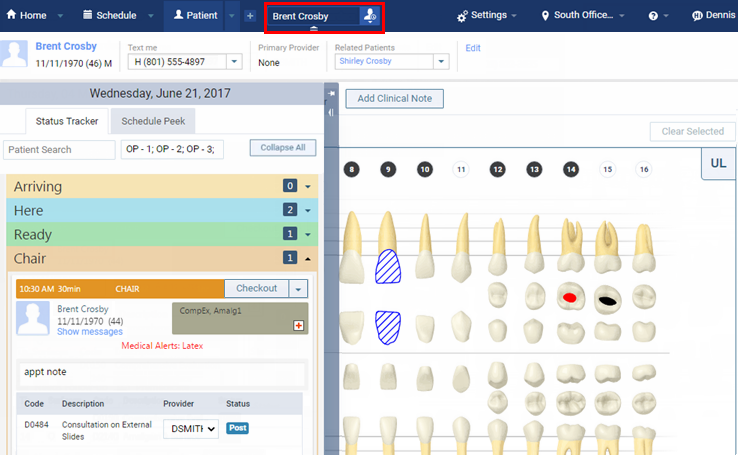 The hygienist in the back office, at his or her computer, sees the notification of the status change, and the patient now appears on the Patient Routing panel under Ready. After escorting the patient to an operatory chair, the hygienist clicks (or taps) the Chair status button. 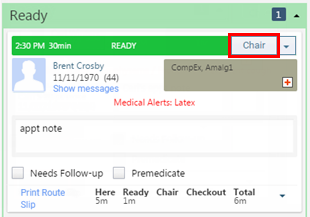 The appointment's status changes to Chair, and the appointment now appears on the Patient Routing panel under Chair. The hygienist clicks (or taps) the notification. 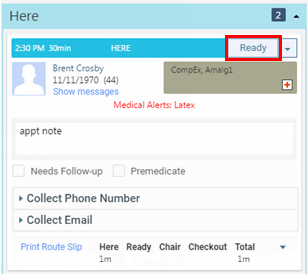 The corresponding patient becomes available (if not already visible) on the Patient Routing panel. On the Patient Routing panel, the hygienist clicks (or taps) the name of the patient who is currently in the chair. The hygienist has the clinical chart of the previous patient open, so the clinical chart of the patient in the chair appears. After work is completed on the patient, the hygienist opens the Patient Routing panel (if it is not already open) and then clicks (or taps) the Checkout status button. The patient starts walking to the front desk to check out. The appointment's status changes to Checkout. 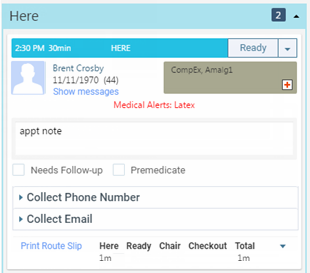 The receptionist at the front desk, at his or her computer, sees the notification of the status change, and the appointment appears on the Patient Routing panel under Checkout. Note: The receptionist at the front desk had the Ledger page of the patient who he or she last checked out open on his or her computer. Then, he or she opened the Calendar page open to schedule an appointment for a patient who called in, and that is the page that he or she is currently viewing when the notification of the status change for the patient that needs to be checked out next appears. The receptionist clicks (or taps) the notification. On the Patient Routing panel, the receptionist clicks (or taps) the name of the patient who needs to be checked out. The Ledger page for that patient opens (because the Ledger page was the last page of another patient's record that was viewed before the receptionist opened the Calendar page). 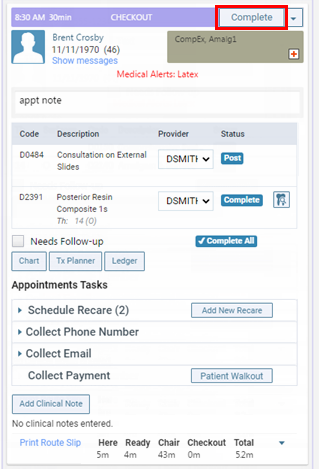 When the receptionist finishes checking out the patient, on the Patient Routing panel, the receptionist clicks (or taps) the Complete status button to complete the appointment. 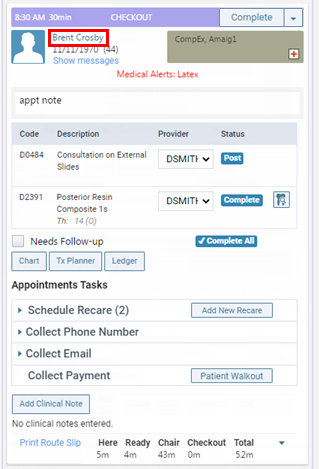 If all the tasks for that patient's appointment are complete, the corresponding patient now appears under Complete on the Patient Routing panel.